This is the last week before half term so I thought it would be worth spending a few minutes thinking about what we have done in music lessons this half term. Can you leave me a comment with your thoughts? What have you found tricky? Are you making music at home that you would like to tell us about? This half term on year four I LOVED COKOO its really catchy and ten pieces. 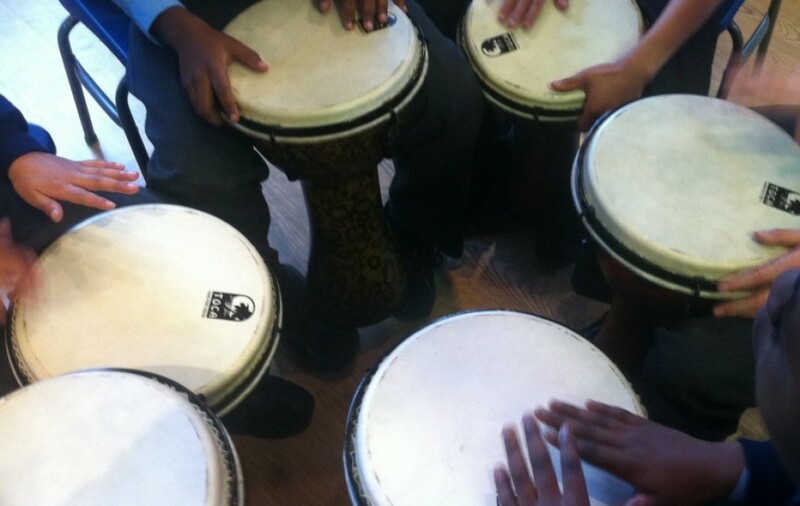 I am really looking forward to hearing you play the acoustic drums for us after half term! the most favorite one was the children dancing !!!!!! The best part of music is Vox pops! We sing songs, not any songs but the BEST!!! I loved when we watched the ten pieces at the part when the children made music with just there moths and hands. Miss Schneider is a really good music teacher! I really liked when we watched 10 pieces. My favorite part was when people were on a boat in crashing waves. I also liked when we played ‘C’ on the piano.I would like to continue learning Old Abram Brown.Thank you for being a great teacher!!!! I loved the Irish version of cuckoo and I also enjoyed playing guitar because I did Hedwigs theme, James bond and Meet the Flintstones. Miss shnider you are the best vox popps teaacher and music teacher. I also liked the club Vox pops because the song we’re learning, Long Way Home, is very good. I would like to make are own songs at music lessons.I found out tricky singing the advent service. I liked the ten pieces!!! Year four this half term have been learning about Benjamin songs like coco we watched the 10 pieces. I found the songs tricky. I want to do the learn the keyboard next term.I dont do music but i did it when i was in year 3 and did guitar. What song did you like the most? This half term I have enjoyed learning Benjamin Brittan songs.My fovourite song is coockoo.I also liked it when we watched 10 peices. Patrick you are learning a lot! My favourite music lesson was when we sang Cuckoo because it’s a very good song. I really enjoyed learning about the song ‘cukoo’ and about Benjamin Britten. I also enjoyed miss S’s club, vox pops because we got to sing new songs. I loved watching ten pieces I also like cuckoo. I like when we put water on the edge of the glass and mostly when we sang Cuckoo and i sang it all night long when i got the VokPops letter. i really liked 10 pieces. This half term i enjoyed learning about Benjamin Britten and when we were singing the song Cuckoo.I has also liked when we wet our hands and make sounds with the cup. I really liked the Benjiman Britten songs.Thank Mrs Schneider for your hard work and I hope we learn exciting song next half term. I liked the cuckoo song.I also liked the ten peices. I enjoyed all the benjamin brittens songs. A great cheer to year6 for a wonderful world war 2 dance. Hey, miss i really loved the Benjamin Britten and the cuckoo because why i loved the cuckoo was that i liked the tone.And i am looking forward to learn and listen to more songs. I hope we have a chance to play something to be more creative in our singing lessons in voxpops. Cookoo was very nice to learn and look forward to another great song! I enjoyed singing though keyboard seemed easier. I like the the Benjamin Britain songs like cuckoo i hope we learn more songs like Benjamin Britain songs the Benjamin Britain songs are really fun. I realy liked vox pops.I realy found it interesting and fun also i found it chalenging.I realy enjoyed it. I really enjoyed the song cuckoo by Benjamin Britten.I hope you will teach us more. I really liked the the lessons you gave us. I really appreciate your hard work.Thank you! Did you prefer singing |”cuckoo” or playing it on the keyboard? Thanks Miss schneider for all your hard work I loved our music classes I am looking forward for another term with you . Thank you Thanumi! I am so glad that you enjoy our music lessons. You too work hard in the lessons as well as me! I really enjoyed voxpops.I am really hoping we could learn to play an instrument like thepiano or somthing.I really enjoyed learning Cuckoo.What song will we learn next? We are going to learn Old Abram Brown next. Such a jolly happy song – NOT!! !